We are a group of women from the central Indiana area who share an interest in working with wood in many capacities. As a group we try to share the skills found within our group and we seek to learn new skills related to wood from sources outside of our group. As we develop new skills we try to help our community in a variety of ways. * We participated in an art display at the Indianapolis Art Center where our work was presented tactilly to the students from the Indiana School for the Blind. 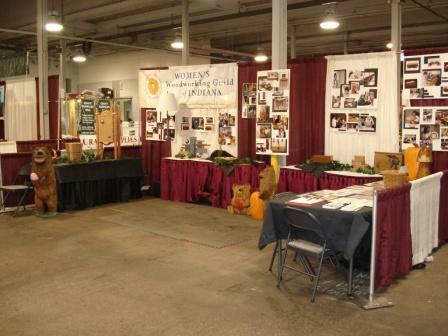 * WWGI had a booth at the Indianapolis Woodworking show at the state fairgrounds. This allowed us to present a sampling of our work and activities. * We learned how to build decorative bandsaw boxes. * Learn a variety of new woodworking skills! * Meet new friends with similar interests! * Network with a variety of other people within our guild and outside our guild at events we participate in.